President Donald Trump’s nominee for CIA director, Gina Haspel, is reported to have overseen a U.S. site in Thailand where torture of a suspected terrorist took place. Later she allegedly helped destroy evidence of torture. Her nomination, pending congressional approval, is viewed by many as further evidence of this administration’s support of torture and an undoing of Obama-era efforts to end it. Her work was allegedly part of a program the CIA launched after 9/11 called Rendition, Detention and Interrogation. From 2002 to at least 2006, the CIA orchestrated disappearances, torture and indefinite detention without charge of suspected terrorists. What can a small group of committed citizens who oppose these practices do to push back? A commission against torture in North Carolina may serve as a model for how citizen-led initiatives can create transparency and accountability for abuses of power in government. In 2005, The New York Times reported that two planes used in the CIA torture program were operated by a contractor based in North Carolina. Forty-nine of the known 119 CIA prisoners were flown from two rural North Carolina airfields to secret prisons or nations with lax policies on torture for violent interrogation. Haspel allegedly oversaw the so-called “black site” in Thailand, starting in 2002 where two of those suspects were held for interrogation. The revelation about the CIA program angered a number of North Carolinians. They condemned the use of tax dollars to fund an aviation facility that was involved in what they believed was illegal and immoral activity. They wanted to end the state’s participationin torture and hold accountable those who were responsible. A grassroots movement began. Over more than a decade, it has evolved into a forceful voice against the use of torture. In 2017, organizers created the North Carolina Commission of Inquiry of Torture, an independent and nonpartisan group dedicated to transparency and accountability for the state’s role in the CIA program. The commission compiled extensive research and appointed 11 commissioners to review the evidence. In November 2017, the commission held public hearings to investigate North Carolina’s role in the CIA’s program. My research explores the importance of understanding torture’s wide-ranging implications for survivors, communities and human rights workers. I also volunteered as a note taker during the hearings. The commission currently invites public input for its recommendations and will publish its report in fall 2018. With it, the commission will seek to determine North Carolina’s responsibility and liability for its participation in the Rendition, Detention and Interrogation program. The nongovernmental, nonpartisan commission builds on the extensive work of North Carolina Stop Torture Now, a coalition of anti-torture citizens across the state. It started with a core group of 10, that expanded to protests of up to 250 people. The organization has partnered with as many as 75 organizations on various public actions. Over more than a decade, the group has staged public and legislative campaigns and educational conferences. The campaigns, described as “neighbor-to-neighbor activism,” have sought to focus public attention on state and citizen complicity with torture. 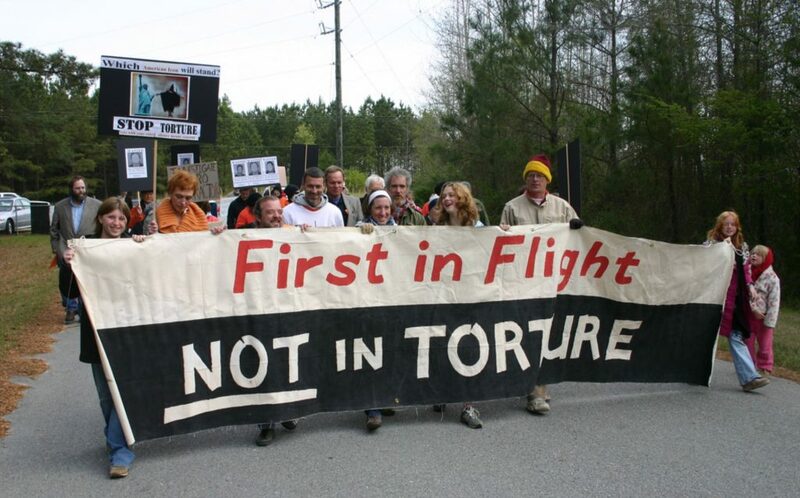 With other civic organizations, NC Stop Torture Now put pressure on state and county officials, as well as Aero Contractors – the company that owned the planes and hangar used to transport suspects. Activists publicized the CIA’s actions and drew attention to laws against torture, enforced disappearance and indefinite detention without charge. In 2007, Aero Contractors decided to sell its hangar at the Kinston, North Carolina air facility. That year, NC Stop Torture Now also helped generate bipartisan support in the state legislature for a billthat would have criminalized participation in CIA-sponsored disappearances and torture. However, the bill stalled the following year and never passed. To date, state officials have avoided any official or lasting response. The Johnston County commissioners have at times gone on record to defend Aero Contractors. Meanwhile, the U.S. government has attempted to shield itself from liability for its torture program. In three federal court cases, the government argued for immunity and for the protection of state secrets. A fourth lawsuit, Salim v. Mitchell, targeted the psychologists who designed the CIA’s interrogation program. The case was settled in 2017 for an undisclosed sum. In November 2017, the commission convened public and private stakeholders, survivors of disappearance and torture, former interrogators, legal and medical experts and citizens. Altogether, 20 witnesses gave testimony during the public hearings. Together with the research the commission has amassed, these efforts provide the fullest picture to date of the local dimensions of the CIA program. Representatives of Aero Contractors did not respond to an invitation to participate. Testimony began with Professor Sam Raphael, co-director of the United Kingdom’s Rendition Project. Synthesizing material from the Senate Select Committee on Intelligence’s report on the program, analysis of flight plans, corporate records and personal testimony, the Rendition Project has compiled extensive documentation of the CIA-sponsored flights. Raphael detailed the Rendition Project’s research on the scope of Aero Contractors’ participation. According to their analysis, Aero Contractors used publicly funded aviation facilities to launch abductions of suspected terrorists from around the world. They were taken to CIA secret prisons, or “black sites,” or to foreign sites where torture was the norm rather than the exception. The researcher offered detailed testimony about abduction protocols, including abductors’ silence, failure to identify themselves and lack of arrest warrants. For the captives, Raphael testified, rendition flights involved removal of clothing, diapering, hooding, restraining, and the forced use of suppositories, which prisoners often experienced as sexual assault. Captives often had no knowledge of why they were being taken, where they were being transported, or how long they would be held, Rafael said. Former counterintelligence, investigators and interrogators Steve Kleinman, Mark Fallon and Glenn Carle also testified. They spoke of the pressure they experienced either from their superiors in their agencies or from the Department of Defense to support the use of torture on captives. He is 44 years old. His hair and beard are graying; his gestures, his look betray the state of anxiety and pressure in which he has existed for many years. How will we live? We both ask, each on our own. I look at him, but I do not recognize him. … We struggle to understand each other. Day after day I realize that this condition will no longer leave us. Another powerful statement came from Allyson Caison, a founding member of NC Stop Torture Now. She explained the difficulty of activism in a small community, in which Aero executives are prominent members. Legal scholars Deborah Weissman and Jayne Huckerby, summarizing extensive research, concluded North Carolina has a duty to adhere to state, federal and international laws that prohibit kidnapping, enforced disappearance, extrajudicial detention, and torture or cruel and degrading treatment. The scholars believe North Carolina is liable for participation in those crimes. Alberto J. Mora, the former chief legal officer of the U.S. Navy and Marines, detailed the costs of the program to national security. The CIA’s rendition and torture program was notable for its use of what Darius Rejali, a scholar of international torture, has called “stealth torture.” These techniques, including waterboarding, stress positions and environmental extremes, are designed to inflict extreme physical pain and suffering without leaving visible traces. Despite the challenge this presents to government transparency and accountability, the commission hearings have created a forum in which the scope of the CIA program can be disclosed and the public can debate the infrastructures that make torture possible.